Um, sorry, quick question...This mod for some reason is not working for me? I am pretty sure I got it right with all of the requirements, and it still is uh... for some reason not playing with my game? I am still getting the default music, and from the video attatched to this mod, it seems utterly wonderful. I would love to get to use it, but I am wondering if I can get any form of advice from other people? Just to get this problem resolved, cause I would love some fresh combat music over the vanilla music... :) Thanks so much. Late response, but did you ever figure that out? I know for me personally, I have multiple music mods installed. In these cases, only the music mod placed lowest on your load order will win. Generating a Smashed Patch from Mator Smash will address this. It reads all the changes from all your music mods and combines them together in a Smashed Patch. FYI, this SSE version isn't really converted yet. The esp still has form 43. You can convert it yourself by opening the mod in the SSE version of the Creation Kit and then saving it again. Creation Kit automatically converts it. Just like Rakren reported, I also have both vanilla and this mod's music playing at the same time. Is this by chance intentional? Is the improved combat music supposed to complement the vanilla combat music. And yes, I did try to load this mod both first and last, but it didn't help. 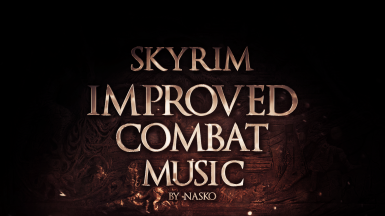 I've never commented on a mod in all my years of playing Skyrim and I'm doing it for the first time here to thank officialNasko for such a badass sounding music overhaul. I've searched the page, but I'm not sure if I missed it or not, but will this mod coincide with other music replacement mods? Or is it selfish and wants to hog the spot light? I just want to know if I should unsub to my other mod before downloading this because I really want to try it out. I could just test it but I don't want to break my game. Absolutely amazing mod that makes those big battles way more intense. The only drawback is this music plays for all levels of battle. So I will get attacked by 1 lowly mud crab and this music will trigger which seems too overkill for the battle. Is there a way to have less intense music for smaller battles? Just completed Bleak Falls Barrow with this mod activated and I gotta say I am very happy with it! Feels new and fresh but still true to the vanilla experience which is exactly what I've been looking for in mods recently. No problems so far, endorsed!